A high-end Novatek NTK96663 CPU, OV4689 sensor 6G lens (front), and Sony IMX323 image sensor (rear) enables low power consumption, high definition video compression and smooth image processing - put together this guarantees superior low light compensation for both rear and front recording. Capture the road all around you in crisp full high definition (1920x1080P) simultaneously front and back. Record in Ultra-HD 2160P 24FPS and Quad-HD 1440P 30FPS with rear camera disconnected, taking photos in 12-Megapixels. Gives your recordings a panoramic quality that encompasses both sides of the road and surroundings. 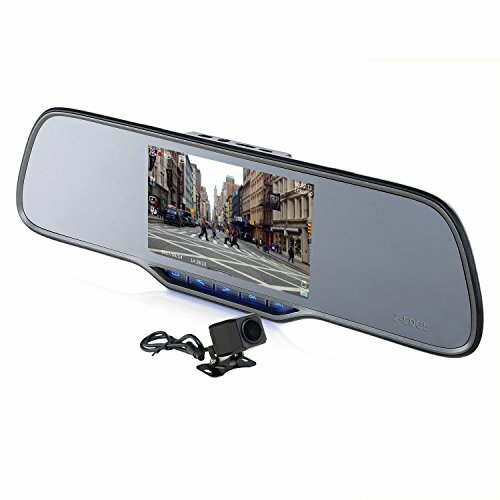 Wide viewing angle films the entire road and your peripherals without edge distortion. Select reverse gear and the Z2 Pro automatically switches to rear camera with the rear view lens connected to the backup lights. From the display screen use the active reverse grid lines to help you parking. If you have any questions about this product by Z-EDGE, contact us by completing and submitting the form below. If you are looking for a specif part number, please include it with your message.